Full length protein corresponding to Calretinin. 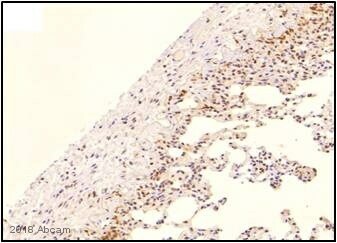 IHC-P: Mesothelioma. 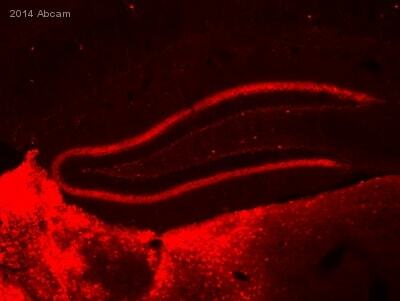 IHC-Fr: Mouse brain, zebrafish retinal tissue and sea cucumber radial nerve cord tissue. Contains a proprietary preservative that is not sodium azide or thimerosal. Our Abpromise guarantee covers the use of ab702 in the following tested applications. For an ABC system, dilute 1/50-1/100 and incubate for 30-60 minutes at RT. Immunohistochemical studies have recently shown calretinin to be useful in distinguishing mesotheliomas from lung adenocarcinomas. However, it is recommended that a panel of antibodies be used in tandem with calretinin. Other antibodies recommended are CK 5/6, E-cadherin, ESA or BerEP4, CEA, EMA, B72.3, Vimentin and CD15. Calretinin does not mark all mesotheliomas (50-70%). Belongs to the calbindin family. Paraffin embedded mesothelioma stained for Calretinin with ab702 (1/100 dilution) in immunohistochemical analysis. ab702 staining Calretinin in mouse brain tissue sections in immunohistochemistry (IHC-Fr - frozen sections). Tissue was fixed with paraformaldehyde and blocked with 3% serum for 30 minutes at 27°C. Samples were incubated with primary antibody (1/250) for 20 hours at 4°C. A Cy3®-conjugated donkey anti-rabbit IgG polyclonal (1/250) was used as the secondary antibody. Immunohistochemistry (Frozen sections) - Anti-Calretinin antibody (ab702)Adapted with permission from Cerveny KL et al, Development. 2010 Jul;137(13):2107-15. Epub 2010 May 26, Fig S1. Immunohistochemistry (Frozen sections) - Anti-Calretinin antibody (ab702)Image from Díaz-Balzac CA et al., PLoS One. 2012;7(3):e32689. Epub 2012 Mar 7. Fig 1.; doi:10.1371/journal.pone.0032689; March 7, 2012, PLoS ONE 7(3): e32689. Immunohistochemical analysis of sea cucumber radial nerve cord tissue, staining Calretinin with ab702 at 1/100 dilution. Publishing research using ab702? Please let us know so that we can cite the reference in this datasheet. I would like to know the expiration date of the antibody ab702, lot number 877133. We do not have specific use by dates for our products. If stored correctly, antibodies remain suitable for use for months and even for years. We are pleased to provide our guarantee for 1 year after purchase. Please review and follow carefully the storage instructions on the individual datasheets. For more tips on how to store antibodies on our website (https://www.abcam.com/index.html?pageconfig=popular_protocols). Other product types are also guaranteed for 1 year. However, specific storage instructions are provided on datasheets and protocol booklets. Sometimes kit components will have a shorter shelf life once reconstituted or prepared and details are provided in protocol booklets for kits. Estuve conversando con el cliente, las publicaciones que necesita es relacionado con las referencias en donde se haya utilizado el mesotelioma como control positivo para Calretinina (ab702). Siento comunicarte que todas las publicaciones que tenemos disponibles sobre el anticuerpo ab702 son las presentes en la datasheet. Espero que consiga la información que necesita. Para cualquier otra información, no dudes en volvernos a contactar. Buenas tardes, podrian por favor enviarme los articulos referenciados en la ficha tecnica de ab702? No consigo acceder a ellos. El resto de artículos no son de libre acceso, es necesario suscribirse a la revista para poder acceder a sus publicaciones. Si no son miembros de la revista, no podrán acceder a la misma online, y me temo que solo podrán consultar los abstracts. Espero que esta información sea de utilidad, en caso contrario, no dudes en volverme a contactar.